Last night I asked Tony what his favorite cake was and he responded with I don’t know. Ummmm excuse me? How do you not know what your favorite cake is? For me cake all depends on the occasion. For example, on birthdays I prefer a rich, moist chocolate cake strictly for the chocolate buttercream. For everything else, I choose carrot cake. Carrot cake is like the Jennifer Aniston of cakes. Never gets old. Classic and elegant at the same time. My mom’s been in town over the past week and we’ve been baking up a storm, including this carrot zucchini cake that we could not stop munching on. It’s has bright orange flavor for some character and a luscious light cream cheese frosting. It’s naturally sweetened with maple syrup and fresh orange juice! 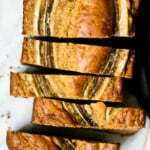 Whole wheat pastry flour adds a nice nutty flavor to the cake, while still keeping it moist. 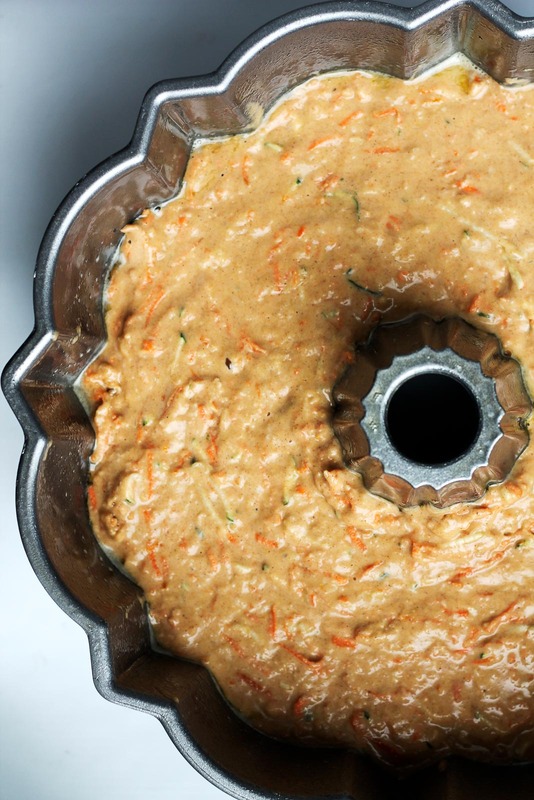 You get TWO veggies (carrot + zucchini) in one cake. Greek yogurt adds both moisture and protein. The coconut cream cheese frosting is to die for. AND IT’S SO FREAKING MOIST. This could totally be a brunch cake too, or get turned into cupcakes for a party — it’s up to you! I’ve included instructions in the note section of the recipe. Hope you love it with a big cup of coffee this weekend. P.S. Thanks so much for being here for zucchini week — I hope you enjoyed it. xo! 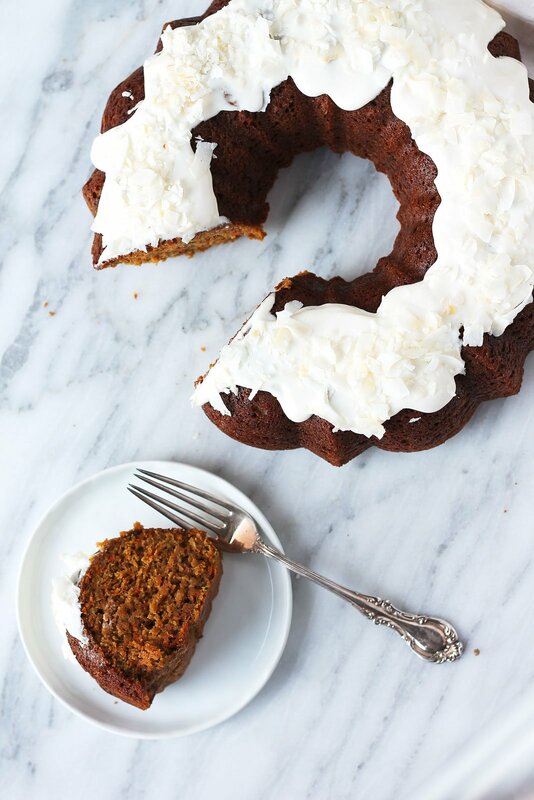 This healthy version of carrot zucchini cake is amazing! Loaded with orange & greek yogurt to keep it moist! 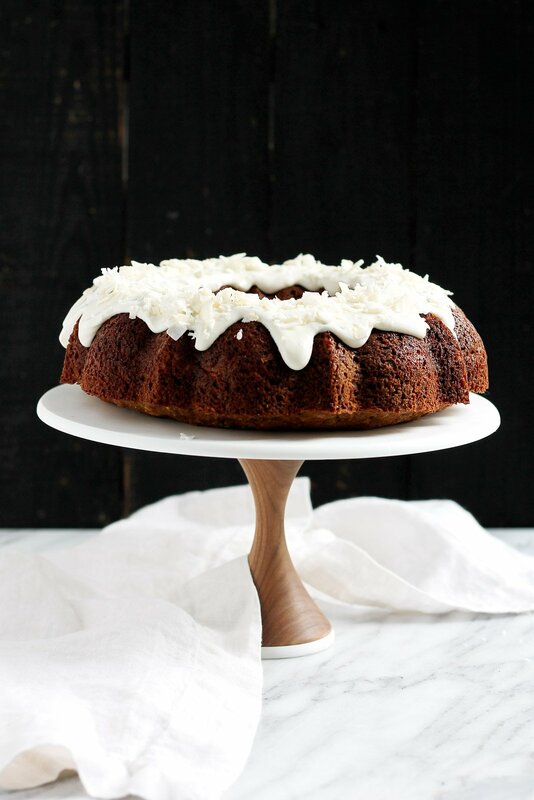 Topped with a coconut cream cheese frosting. Preheat oven to 350 degrees F. Spray 12 cup Bundt pan generously with nonstick cooking spray. In a large bowl, combine flour, baking soda, salt, spices; stir well with a whisk. 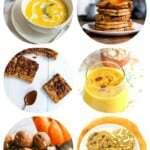 In a separate large bowl mix together all wet ingredients: zucchini, carrots, shredded apple, eggs, maple syrup, vanilla extract, coconut oil, orange juice, zest and yogurt. Mix wet ingredients with dry ingredients until just combined. Fold in shredded coconut flakes. Pour batter into Bundt pan. Bake for 40-55 minutes or until wooden toothpick inserted in the center comes out clean. Transfer to wire rack for 10-15 minutes, then invert cake onto rack and allow to cool completely. To make cream cheese frosting: In a medium bowl, beat the cream cheese, powdered sugar and coconut milk together. Spread over the top of the cake. Top with the unsweetened coconut flakes. Serves 16. Optional add-ins: 1/2 cup chopped pecans or walnuts, 1/2 cup of crushed pineapple, 1/2 cup raisins -- all would be delish! You can also bake this cake in a 9x13 inch pan, but remember to reduce the baking time. I would check around 30 minutes. 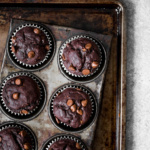 Make these into cupcakes by reducing the baking time to 20-25 minutes, or until toothpick comes out clean! 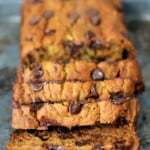 Healthy Pumpkin Zucchini Chocolate Chip Bread + big news! 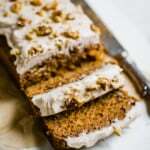 13 Responses to "Orange Carrot Zucchini Cake with Coconut Cream Cheese Frosting"
Ha! Ha! I never thought to compare my cakes to Jennifer Aniston. I’m with you. . .I always tend to go for carrot cake as I like all the textural elements that the carrots, pineapple, etc add. And this carrot cake?! What a beauty. I love that it has been health-ified with the yogurt and orange juice. . .which means I can munch away and still feel like I am not completely sabotaging my time spent in the gym. 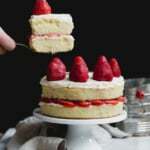 Oh my goodness, this cake looks incredible and i LOVE the flavor combinations!! Totally going to make this asap! This looks amazing!!!! Definitely will have to try. Where is your marble board from? So sad to see zucchini week come to a close, although this cake is definitely the perfect note to end on! Hi ! Looks amazing ! Can’t wait to try it out …., can I substitute the Greek yogurt with anything ? Does applesauce work ? Thanks ! Could you swap out the coconut oil for applesauce? The results wouldn’t be the same and honestly, it’s such a small amount of coconut oil for an entire cake! You can sub applesauce for greek yogurt though! 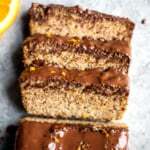 Would it be possible to swap the flour for coconut flour/almond flour to make it GF?